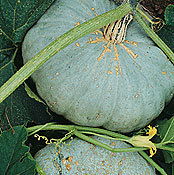 description for "Winter Squash and Pumpkins: Cucurbita maxima, 'Sweet Keeper'"
Cucurbita maxima 'Sweet Keeper' is for you if you like a large squash. A Seeds of Change selection, 'Sweet Keeper' has a deep-orange color and is high in beta carotene. The vines are like the ones in Jack in the Beanstalk, some runners growing 25-30 ft. long! 10-15 pound flattened globes are a prime choice for pumpkin pie. Stores magnificently, into spring. (95-105 days) Planting depth: 1 inch. Days to germination: 3-7 days. 95-105 days to maturity. reviews for "Winter Squash and Pumpkins: Cucurbita maxima, 'Sweet Keeper'"